9th February, 2009. Glenrock Lagoon. Newcastle. 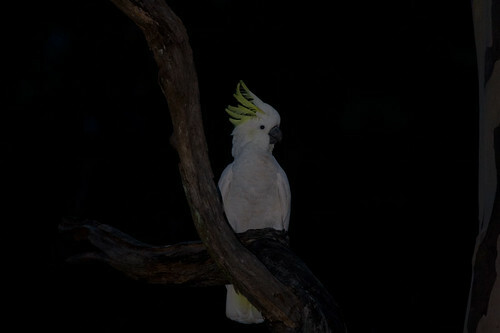 This evening I went to Glenrock to test a flash set up. I had an external flash – an el cheapo ebay one – tied to a canon flash cord. I had the flash to the side mounted on a right angled flash bracket. I wanted to test if I could get a picture in the bush under extremely bad lighting conditions. So I trudged on down the track from kahibah that goes down to the creek. But there were no birds at all in sight. I could hear heaps of bell miners and other stuff going off their brains, but nary a one could I see to take a photograph of. 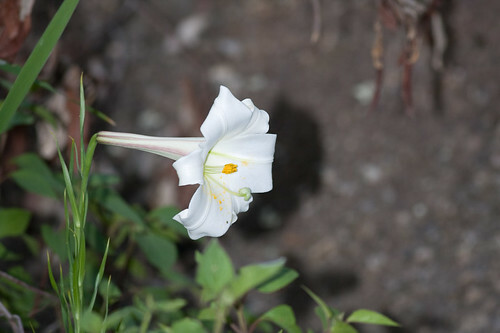 Eventually I got down to the creek and had to take a photo of a white flower. Here it is.. This was at 7:07pm with an overcast sky. Exposure was: 1/250 shutter speed, Aperture of f/5.6, ISO400. Manual Mode. I think this is quite good. There is plenty of detail in the flower and the lighting is quite good. Not brilliant but reasonably good. I would be happy with this. 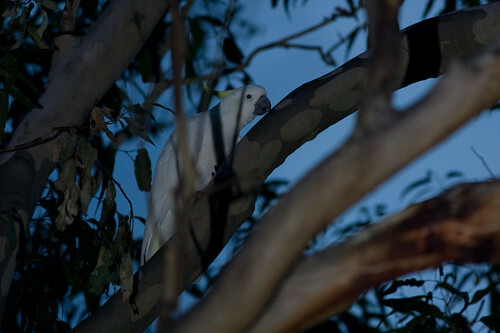 Then some sulphur-crested cockatoos roosted in some trees above the creek. So at last I could test the strobe on some birds. I used the same exposure but it was a bit later in the evening at 7:33pm. I have no idea why the background on this one is so dark and the next one I got a blue sky. Weird. And here is the final one at 7:36pm. It is getting quite dark by this time and there is very little light. I am glad that I was getting any picture at all. So what are my conclusions from this very less than scientific experiment? I think my setup could be successfully used to photograph birds under extereme lighting conditions such as in a rainforest or very early or late in the day. I am confident that I can use this rig for photographing birds under the canopy.